The Unassuming Economist | How Reliable is China’s Output Data? “There is some evidence pointing to possible overstatement of growth recently, but the overstatement is likely moderate and the official national accounts data—while there is much room for improvement—likely provide a broadly reliable picture,” according to an IMF report. 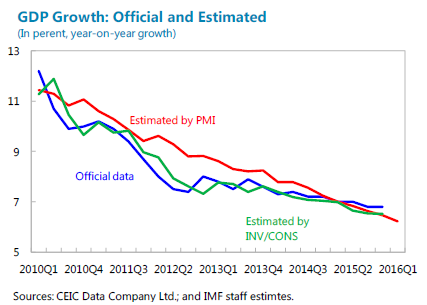 China’s nominal GDP is probably larger than the official estimate. This could reflect flaws in measuring service consumption, including the inability to fully capture the switch from state-owned industrial firms to market-based (and often smaller) service firms. A study by the Rhodium Group, which duplicates the authorities’ statistical methodology, but addresses some key weaknesses, suggests nominal GDP is underestimated by, for example, 13–16 percent in 2008, and some other studies, while using different approaches, show similar results. But growth may be smoothed since the smallest and most volatile firms may not be adequately captured in the statistical methodology. Indeed, skepticism that growth is overstated has grown recently, arising largely from the more pronounced weakening in some hard indicators compared to official growth data, including consumption of energy, industrial value added, and commodity imports. A few studies indicate that growth is not overstated over a long time horizon, but that the volatility is understated. Some further argue that the official nominal GDP data are reliable, but the weaknesses in deflators cause real growth to be smoothed. For example, the single deflation approach, which deflates input and output using the same deflator, tends to overstate growth when commodity prices decline sharply. But a counterargument is that the dynamism in the service sector is robust and not well reflected in the hard indicators mentioned above. For example, private consumption is buoyant, with retail sales growing by around 10 percent y/y in real terms. “Underlying” growth may be weaker than officially reported, but only somewhat. Correlation. A sudden decline in the correlation between overall growth data and individual hard indicators could signal that the official data might overstate growth. However, looking at 12-month rolling correlations for real GDP growth versus electricity production, cement, crude steel and freight, does not suggest a recent significant decline (though the series are noisy). High frequency-based estimates. Out-of-sample estimates of growth from high-frequency PMIs and consumption/investment indicators are about ¼‒ ½ percent lower than official growth data in 2015.